Saturday August 10th 1901 I hurried through my baking and brought Mother out to dinner. In the afternoon we went to the West farm. Ida went to town. I brought her home from Woolfs. Will made two trips to the valley for fence parts. Weather cooler. Sunday August 11th 1901 another warm day. I did the work in the morning and read and rested in the afternoon. Ida gone all day It looked like rain but it did not come. 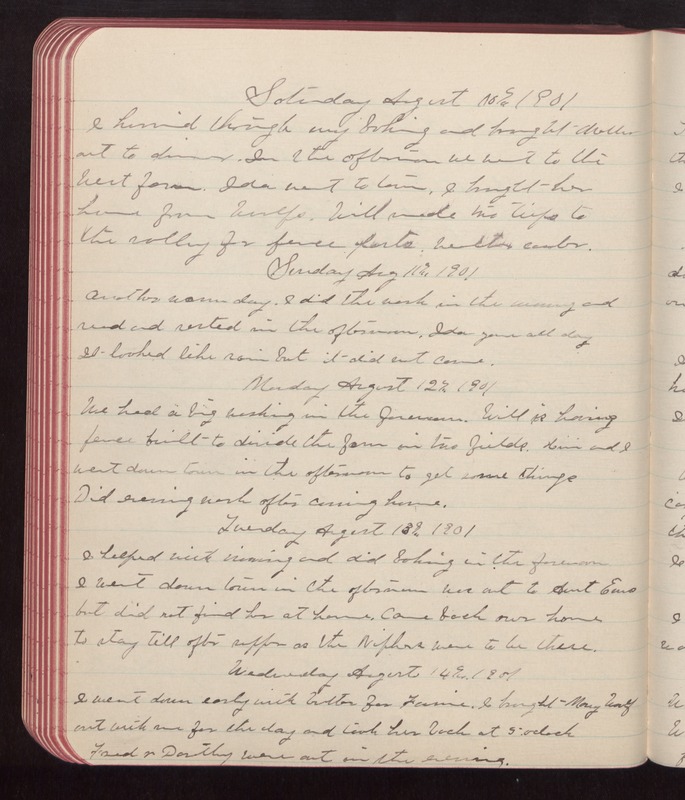 Monday August 12th 1901 We had a big washing in the forenoon. Will is having fence built to divide the farm in two fields. Him and I went down town in the afternoon to get some things Did evening work after coming home. Tuesday August 13th 1901 I helped with ironing and did baking in the forenoon I went down town in the afternoon Was out to Aunt Ems but did not find her at home. Came back over home to stay till after supper as the Niphers were to be there. Wednesday August 14th 1901 I went down early with butter for Fannie. I brought Mary Woolf out with me for the day and took her back at 5 oclock Fred & Dorothy were out in the evening.